Sounds like the one Andy White runs in Melbourne. 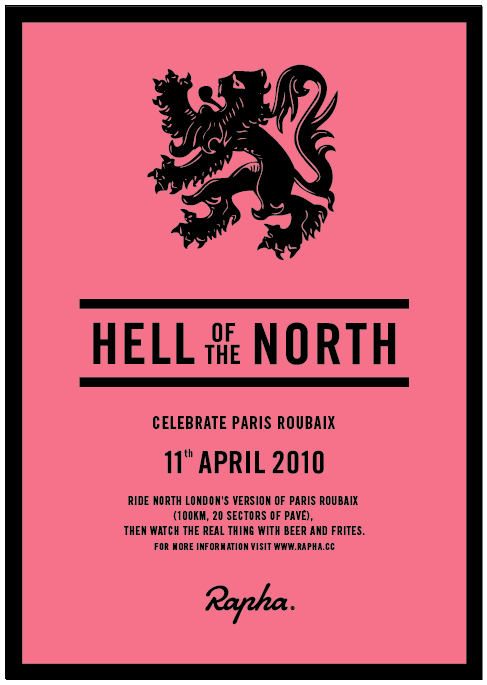 http://www.rapha.cc/the-rapha-top-ten-fo­r-2010 - On Sunday 11th April, Rapha will be organizing a Hell of the North ride through North London and Hertfordshire. 28 sectors of lanes, bridleways and the closest to pavé we can find [this means gravel - Ed.] will be the course and the finish will be at a pub to watch the race proper and enjoy free beer and frites. Surely you know by now, south rules. And this is only 40 miles or so, so we will be in the pub on the south london alps sooner. Whilst you northeners will probably still be cottaging on hamstead heath. i'm sure we we all enjoy our different pursuits. But you are cycling north of the river. Well.. you wouldn't cycle south of the river would you? Here be dragons.. This is a confusing thread. Are we now talking about the Rapha sponsored 'London classic' instead of the actuall thread starter? I like the look of both of them, but the first looks like it'll be a hell of a lot easier going! Oh, and they're on the same day! is it expensive to join the ride ? No idea I am afraid?... I don't think the details have been released yet. Whatever though I am all over it! There's still no information about it. I think it is quite expencive. Good though. The number of merged threads is clearly multiplying since a certain, er, event. Good though. I am assuming you're talking about me. I've never merged a thread. I have only ever suggested them to VB. I did see this but couldn't try the merging out since i couldn't recall the name of the original and had work to do anyway. Ah, I thought it was your good work. Must have been Velocio, then. Yep. I'm not even sure how to merge stuff yet. I've just done some thread titles. Nice and boring stuff. Are many people doing this (the Rapha ride). A couple of us from Glasgow are thinking of coming down for it and would appreciate somewhere to stay on the Saturday and Sunday nights. And more information can be found here. what bikes are people using??? I think a road bike with 25c or 28c tyres and mudguards would be ideal for it but we'll be doing it fixed (perhaps with some modifications like wider tyres, mudguards, two brakes and road levers). I'm probably going to be running a 70" gear. You don't want mudguards on terrain like that. They'll get clogged up with mud and foul the wheel.